Ryan and I want to have some Swedish elements to our wedding reception without going over the top. Here are a few of the things we're thinking about! I think it would be fun to wear my mom's clogs from Sweden at the reception, at least for a little while. I'll end up taking off my shoes for dancing no matter what shoes I'm wearing anyway, so why not?! 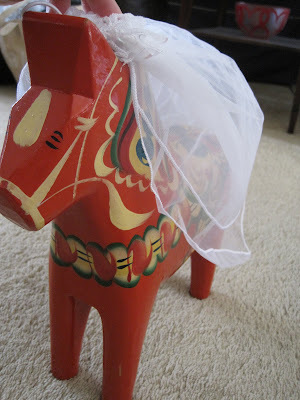 I know I've mentioned before the Swedish-themed candy table, and we're thinking of putting a red and blue dala horse on the table (centerpiece?). The red horse will wear a veil and the blue one a top hat. Ryan keeps mentioning how he wants to wear a top hat at the reception. What do you think? And I'm still debating about centerpieces. Flowers are always beautiful and easy (although they can get pricey), but I still want to do something crafty but not crazy. Any ideas? After the earthquake, tsunami and nuclear problems in Japan, Ryan and I decided to move back to America 3 weeks earlier than we had planned. We arrived in Texas about a week ago, where I spent some wonderful days with Ryan and his family (after some not-so-wonderful days frantically packing and moving out of our apartments in Japan). I then flew back to Michigan and drove down to Chicago with my parents to visit family there. I just arrived back home (Michigan) yesterday and am still busy unpacking, organizing and locating all my crafting items in order to start crafting in order to start blogging again! Phew. I'm tired. It's been a whirlwind of events and emotions since I've been back. 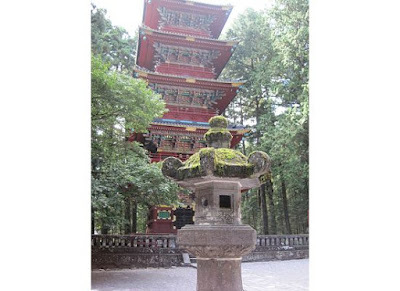 I already miss my friends and life in Japan but am also overjoyed to be with family again. Thanks again for all the kind e-mails and prayers! I'll try to update later with more info., just wanted to let everyone know we were okay. 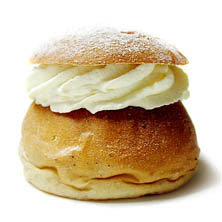 If you haven't indulged in a few semlor yet, nows the time! When I was searching for some semlor pictures I came across this Swedish bar and grill in London called Fika. That is their lovely photo of a semla bun. If you live in London you should probably go there and try their herring, cream cheese and cucumber breakfast waffle - it sounds delish. Back to semlor. If you don't know what semlor are they are a cardamom flavored bun with almond paste and whipped cream inside and on top. Some Swedes eat their semlor bun in a bowl of milk. I've never tried that but I'm sure it's delicious. They're sooo good. 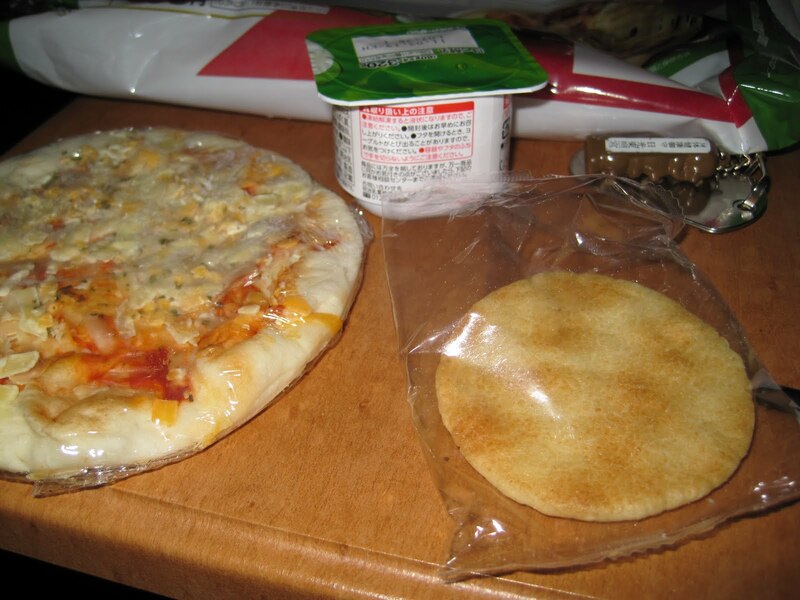 This is one of those days were I especially wish my apartment had an oven so I could whip up a batch. Alas, I can't. But maybe you can, so here's a recipe! Melt butter and add the milk. Activate the yeast and once mixture is cool enough add the yeast to the milk and butter. Add the salt, cardamom, 1 egg, sugar and 600 ml of the flour. Knead until mixture is worked into a smooth dough. Cover and let rise for 30 minutes. Mix the baking powder and remaining flour together and knead into the dough. Cut dough into 12 pieces and roll into buns. Place buns on a cookie sheet and let them rise for 35-45 minutes. 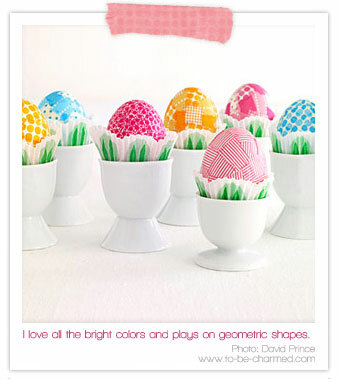 Beat the remaining egg and brush the tops. Heat oven to 400 F and bake for 10 minutes, remove and cover with a cloth and let cool. Once cool cut out a small hole in each bun. Put some marzipan in the hole and then add whipped cream. Replace the "top" to the bun and dust with powdered sugar. Time is flying around here. I can't believe my last post was over a week ago, where has time gone?! Japan is keeping me busy, I'm trying to cram in all that I can before I head back home in just 1 short month. One of the things I've packed in already is stocking up on Japanese craft items. 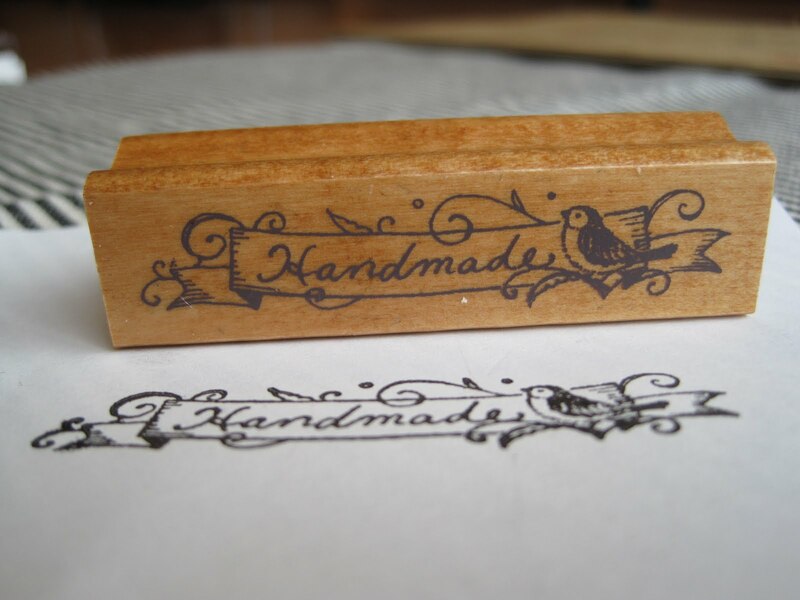 I've been searching for a "handmade" stamp that I could use for tags when I do another craft fair and I finally found [a reasonable] one! I've found a few others but they were over $10?! No thanks. 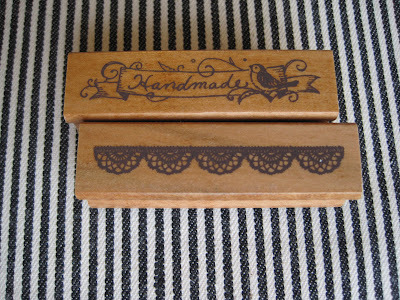 This little gem came with another stamp, both for $5 - success! 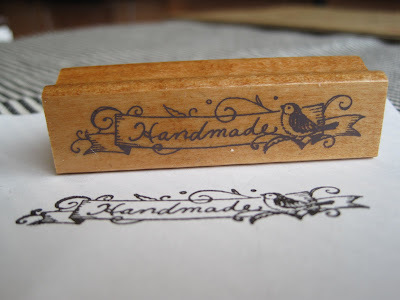 I'm looking forward to stamping away to my heart's content making cute little gift tags! I want to do the Los Angeles Unique LA craft fair again. My roommate and I did the Holiday fair 2 Christmases ago and had tons of fun! It was our first craft show ever and I loved it. I've been wanting to do another ever since. Anyway, back to Japanese craft items. Washi tape. I already have quite the variety ready to take back home with me but when I saw these adorable Spring designs I snatched them up. 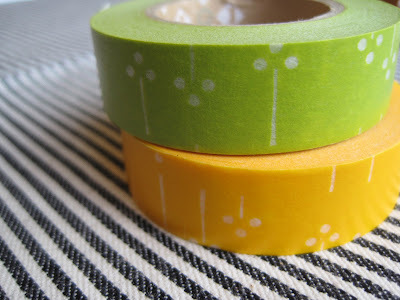 Washi tape is so versatile, you can jazz up just about anything with it. 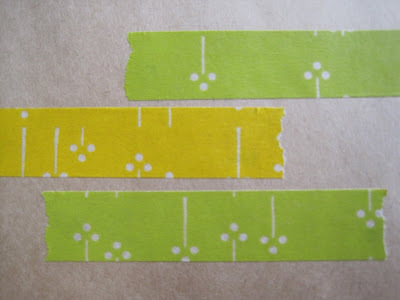 I had a washi tape giveaway a while back and posted various ideas of how to use it. 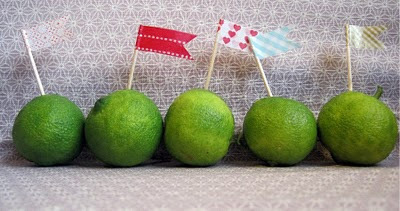 I love the little flags, they would be adorable in cupcakes. I will certainly miss all the super adorable Japanese craft supplies. Luckily there are quite a few Etsy shops that sell washi tape and Japanese fabric!